I recently finished “Life Is A Wheel” by Bruce Weber. It’s is a fairly simple book about a man’s journey as he rides his (very expensive) bike across the United States. The book chronicles the trip from Oregon to New York with intermittent advice about distance cycling, personal anecdotes, logistical notes and observations of middle America. Reading about Bruce, his life and his motivations, it’s easy to root for the the author and I wish him well. To me this book seems more like a series of travel blog posts than a compelling adventure story. In that sense, some portions felt like filler. I think “Life Is A Wheel” would most appeal to people in similar situations to Weber. People who are ready to take stock in their own life accomplishments, people unsure about aging and what the future holds. I do appreciate the honest and open writing style of the book, and at some points it seemed like Weber was using the writing process (and bike riding) as therapy. My biggest take away from this book is that it inspires me to ride my bike and to write, which is a good thing. Many consider Los Angeles, California the Entertainment Capital of the World. It is where people go to chase their dreams, to make it big. Some stay, some go, some just pass through. Few leave their mark, many more don’t. On Sunset Boulevard I recently visited a place where one musician has left his mark, even if he doesn’t know it. You might not know the name Elliott Smith, but you’ve probably heard his music. He was heavily featured on the Soundtrack for “Good Will Hunting”. His style incorporates whisper-soft singing over simple acoustic guitar with lyrics that can be mellow yet haunting. Much of his music is both simple and complex, the sort of music that’s best enjoyed at night and while not distracted. 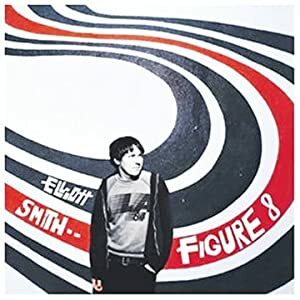 The cover of his album Figure 8 is a black and white photo of Elliot standing in front of a mural of curved red and black lines. It’s pretty simple and straightforward, probably one of dozens of other promotional photos taken that day at various places near the music studio. But like the cover of the Beatles’ Abby Road or Bob Dylan’s The Freewheelin’, this simple image and place has now become eternally linked with this artist and his music. The wall is located on the South Side of Sunset Boulevard next to a McDonalds and a Mexican Taqueria, and recently I went to check it out. The red and black swirling lines were accompanied by a combination of graffiti tags, tributes and lyrics. The wall has been painted, and repainted many times since the albums release in 2000 and become an ever-evolving place of expression for fans and as well as graffiti “artists”. Inspired by visiting the wall, I figured I’d put together a list of 4 of his songs I’ve enjoyed most over the years. Now I’m a policeman directing traffic, keeping everything moving, everything static. This song paints a vision of world through a lens smeared by the effects of drugs and alcohol. It’s performed with the honesty of a man dealing with addiction and regret, and his voice and guitar tell the story of a guy walking alone late at night with cloudy vision. Through it you see a blurry vision of the moon above the artist and a darkness within. A prototypical example of the artist’s style, Pitseleh combines simple acoustic guitar, heartfelt lyrics, and whispering melodic singing. It’s the kind of song that easily melts into his other works, yet can stand up on its own. you tell me, the morning after. I am content, so long as I have something to eat, good health, the earth to take my stand on, and light behind the eyes to see by.